Pioneer has long been known as DCI's "Irish" corps, proudly stated by their shamrock-emblazoned caps and traditional Irish theme, "Garry Owen March." But like the millions of Irish immigrants and their descendants who made the U.S. their home, the World Class group's true identity is a mixture of Celtic and American cultures. "We always have a hint of Irish in our shows, sometimes more, sometimes less," says corps director and founder Roman Blenski. 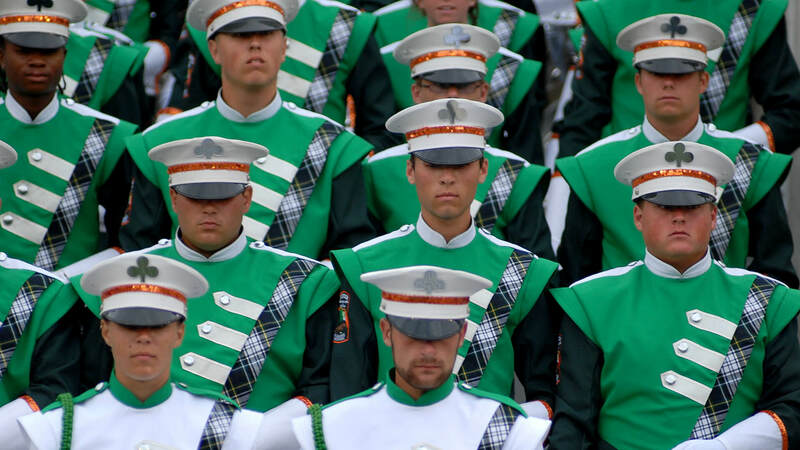 "It's not necessarily authentic–but we tend to try to make anything sound a little bit Irish, and we tend to like to think of ourselves as D-C-I: Drum Corps Irish." The group's Hibernian image can be traced to its formation in 1961 as an activity for the youth of St. Patrick's Catholic Parish in Milwaukee, Wisconsin. Originally known as the Imperials, the drum corps merged with another local outfit, the Thunderbolts, in 1973. This amalgam called itself "The Thing" for a year before becoming the Pioneer Drum & Bugle Corps. Interestingly, the name Pioneer wasn't chosen to honor American settlers–Irish or otherwise. In 1974, the organization received sponsorship from the Cedarburg, Wisconsin-based Pioneer Container Corporation, and took the company's name. The sponsorship eventually stopped and the company went out of business, but the moniker remains. Over the years, Pioneer's image and repertoire has veered in different directions, but by the mid-1980s, the Irish identity started to take hold. In 1991, Pioneer won the DCI A-60 World Championship with a program called "Irish Festival." 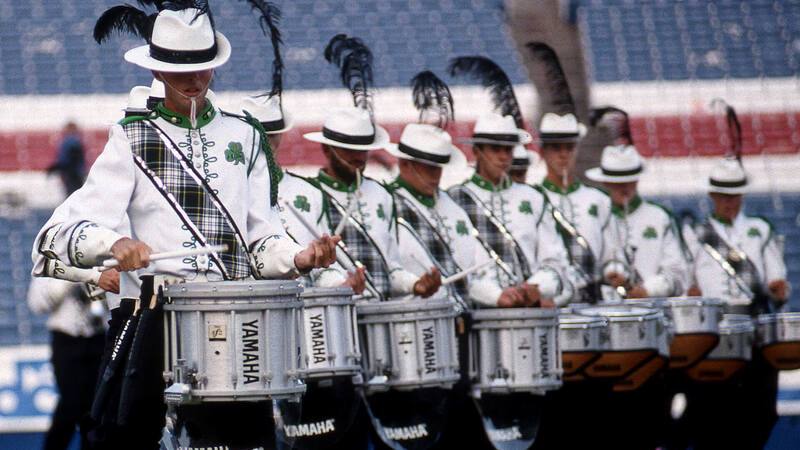 After using Irish show themes on the way to Division II titles in 1994 and 1995 (and a close second in '96), the group made the jump to DCI's Division I (now known as World Class) in 1997. By then, Pioneer's "Irishness" was firmly established, and remains even when the group explores other musical styles. "We've gone through [a variety of program themes], but [the repertoire] does have Irish flavoring all the way through," Blenski explains. "It enhances everything we do–not only in the uniform, but in our way of thinking." Since the early 1990s, the group has been able to share that way of thinking with members from all over the world, including South Africa, Japan, England, and occasionally, Holland and Canada. "I think part of the reason is we go out of our way just to treat [the members] a little bit special," Blenski says. "That's what's made it attractive for them." New members each receive a chain with a shamrock upon joining (which Blenski compares to a military dog tag), personalized with their member number. "We've documented every member who joined the corps from day one–and I think recently the last member to join is number 2,600 something ... We've been around 54 years, so we have a lot of traditions of our own." Some of those traditions include an annual tour of the parish where the group began, visits to historic sites around the country, and non-denominational church services every Sunday morning. "We like to see ourselves as a complete package where the students get a good all-around experience being in a touring corps," Blenski explains. The corps also marches in about a dozen parades a year–including six in the Milwaukee area alone–to play an active role in the community. Yet if one tradition best matches Pioneer's Celtic identity, it's the annual trip down Interstate 94 to march in Chicago's South Side Irish Parade to celebrate St. Patrick's Day. "It's an incredible parade. There are just thousands of people–and I'm almost certain that most of them are not Irish," Blenski laughs.